All 33 games from the BBC – including England’s Group G games against Tunisia and Panama, and the final from Moscow – will be available via the BBC Sport VR 2018 Fifa World Cup app. Users will be able to watch the action direct from the stadium in a fully immersive environment – as if you were actually watching from inside the stadium in your own hospitality box. You can watch in VR on your smartphone, tablet or – for an enhanced experience – VR headset. Please note: the BBC Sport World Cup VR app is separate from the main BBC Sport app – it is a standalone app purely for this virtual reality experience. 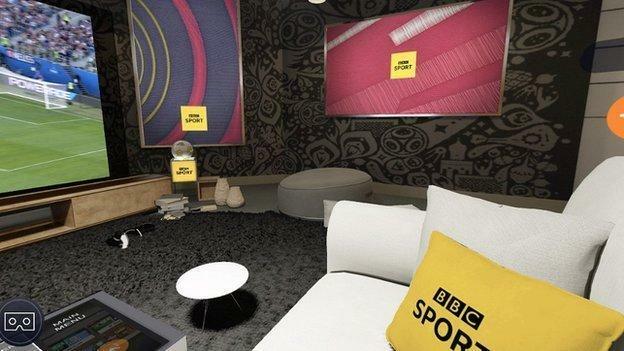 Inside the app, users will enter the BBC’s virtual World Cup lounge, where they will be able to access live match action and highlights. Certain content may not be appropriate for all users and may contain repetitive flashing images, such as strobe effects. The app is suitable for people aged 16+ years. This is provided on an ‘as is’ basis.